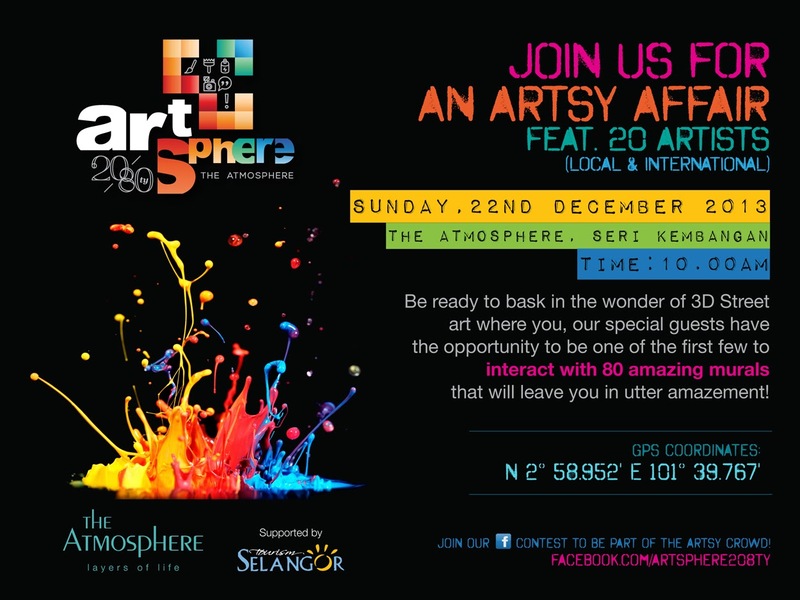 As stated on the e-invitation above, we’re all invited to go play around with 80 different 3D street art murals at the grand launch of The Atmosphere in Seri Kembangan Selangor this coming Sunday (22 December 2014) from 10am onwards. The admission is free so anyone could just go in and check out the new mall, “interact” and take epic photos with the murals and just have a real good time. That’s not all, Artsphere 20/8ty will also be running a Strike a Pose Photo Contest on Facebook where all attendees can submit their photos taken with the arts at The Atmosphere for a chance to win prizes worth a total of RM15,000! There’ll be two ways of winning in this contest: Most Liked Photo (public voting) and Most Creative Photo (entries to be judged by the Management of The Atmosphere). The contest will begin on December 22nd 2013 and end on February 16th 2014. With all that being said, you won’t want to miss this. It does seem like a very fun place to visit, I’ll certainly be there myself and I just can’t wait to check out these murals and create some epic photography with them. It’s gonna be cool, I’m sure! UPDATE: Check out the photos taken during the launch. For more info, please log on to fb.com/artsphere208ty or theatmosphere.com.my.